We started with Winter (Minnie's choice) & for this we used; arborio risotto rice (the pearly risotto rice has a glossy, smooth texture making it perfect to represent snow), silver glitter/stars, mini red pompoms/bells (to represent berries), mini silver & white pompoms (to represent snowballs), a couple of stars, & a few foam shapes (holly leaves, small Christmas tree, snowflakes, & a tiny gingerbread man). 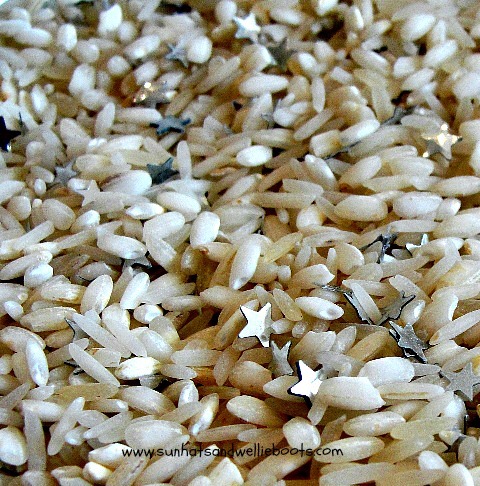 Minnie started by mixing the silver stars with the rice in a baking dish, then scooped a little of the mixture into the bottle. Creating these bottles offered a multitude of sensory experiences. 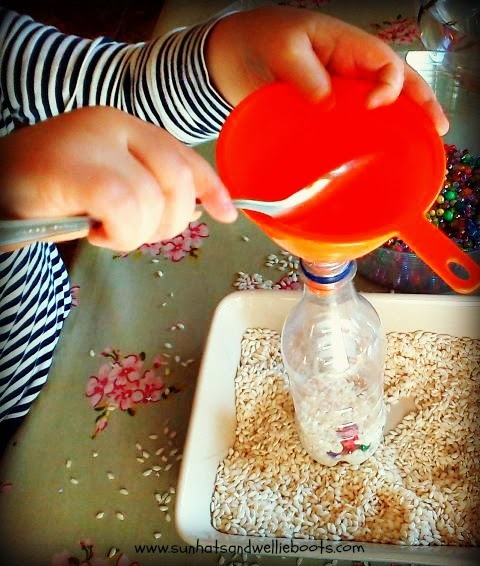 Minnie especially enjoyed sifting, pouring, patting & rolling the rice around with her hands. She continued to fill the bottle with her hands, adding her chosen 'winter' items as she went. When the contents had reached the neck of the bottle we added the lid & secured with strong glue. Alternatively you could seal with tape. Then we moved on to create our Autumn bottle. 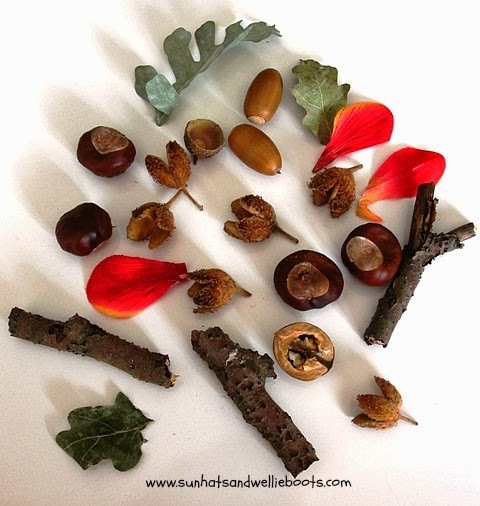 For this we used: tricolor pasta shapes, a collection of finds from our nature walks (acorns, conkers, mini pine cones, sticks, leaves, beechnuts, walnuts) & a few silk petals in autumnal colours. To create smaller pasta shapes we poured the pasta onto an old tray, placed an old towel over the top & crushed the pasta with a rolling pin. 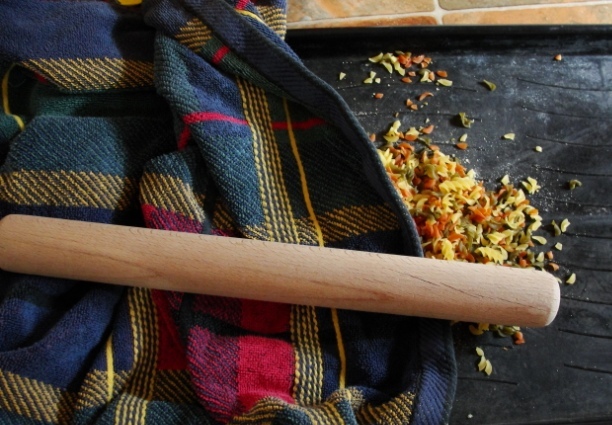 Minnie had great fun banging the rolling pin over the towel & then rolling it over the bumps. A great way to observe gross motor skills & great to see her energy as she excitedly rolled (& thumped) the rolling pin over the pasta. When the pasta had been pounded (!) 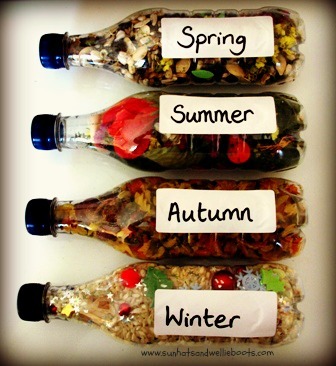 Minnie added it to the bottle as before, along with her mini autumnal finds. We discovered that adding a little filler (pasta) first, then adding an item or two, followed by more filler & then repeating gave the best results. 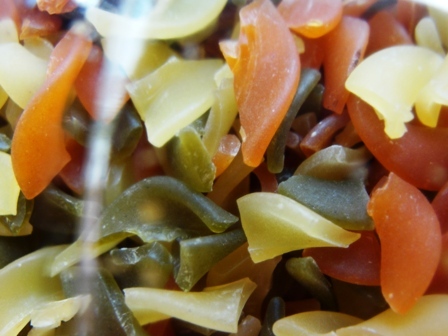 The tricolor pasta created some great autumnal colour in the bottle. Lentils would make a good alternative, we just used the pasta as it was in our cupboard at the time, & I knew Minnie would love hammering the pasta & creating lots of noise! The bottle was sealed as before, then ready to investigate. Our Summer bottle was our next creation, & for this we used three small jars of dried parsley, dried statice flowers, small silk flowers in a mix of bright colours, dried peas & beans, mini plastic butterflies & bees, & small ladybirds. The dried parsley represented grass, & was a nice addition to the summer bottle as it's one of the herbs Minnie has been growing in her garden area. We sealed as before, & our summer bottle was complete. Finally our Spring bottle. 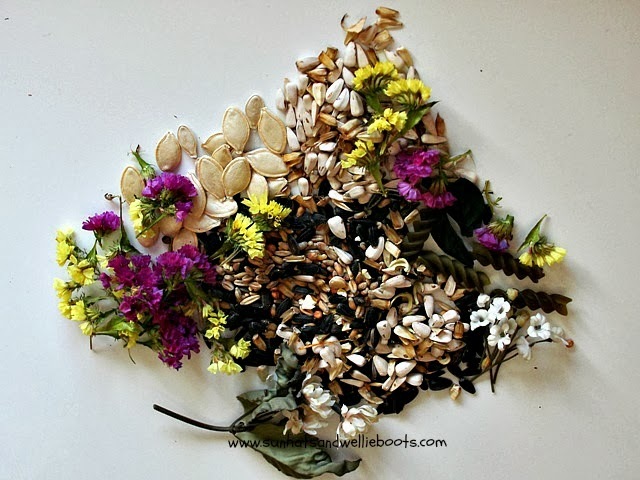 For this was used; flower seeds (collected from our garden a few weeks ago), pumpkin seeds, dry bird food (small seeds), dried statice flowers, green silk leaves, sprigs of silk blossom, a few small leaves cut from green foam, a plastic butterfly & spider. 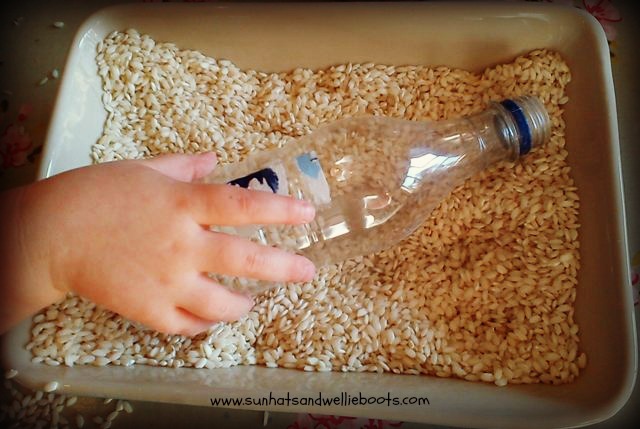 As Spring is the season for planting seeds it seemed appropriate to add them to this Spring discovery bottle. Hopefully the few small flowers & tiny green leaves will represent the new life that Spring brings. 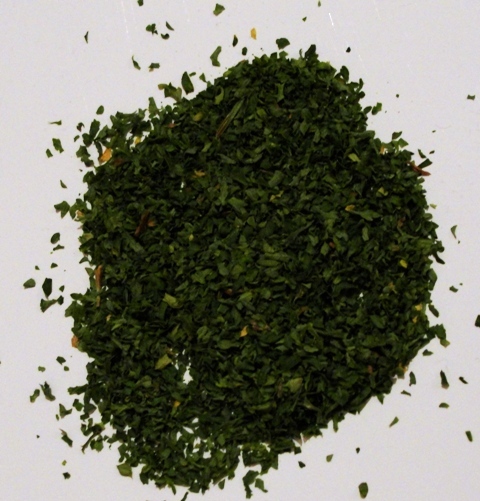 It's nice to think that Minnie collected these seeds from plants she sowed last Spring. 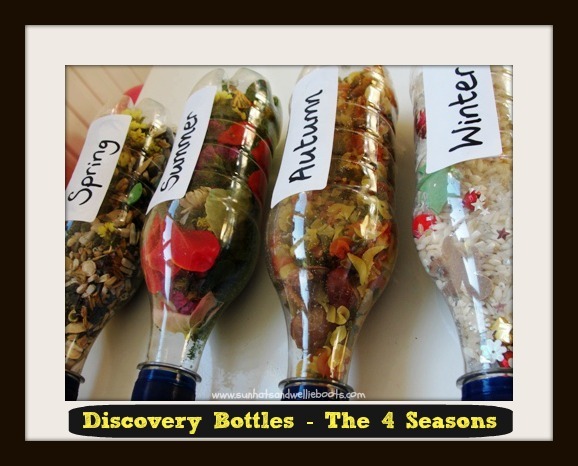 I attached four labels identifying the four seasons, & our Discovery Bottles were ready! 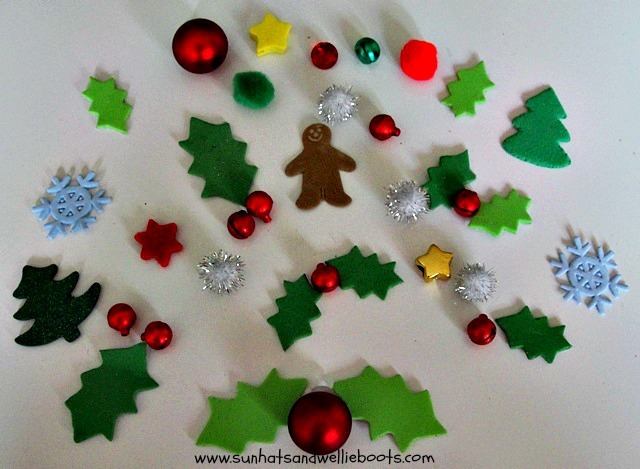 These can be explored separately, or alongside each other & used to compare the seasons. They encourage observation skills, discovery, predictability, & offer an opportunity to investigate nature, colour, shape, & pattern. They can prompt a wealth of language, conversation & stories, & can be explored individually or with a group. 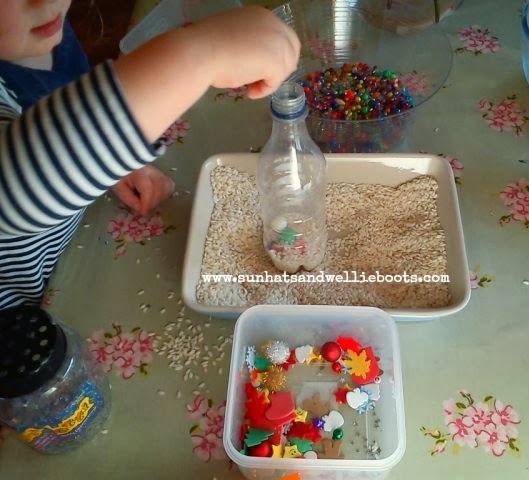 And the thing that I love most about these frugal, fun bottles is that children of all ages can independently explore them. Fantastic!